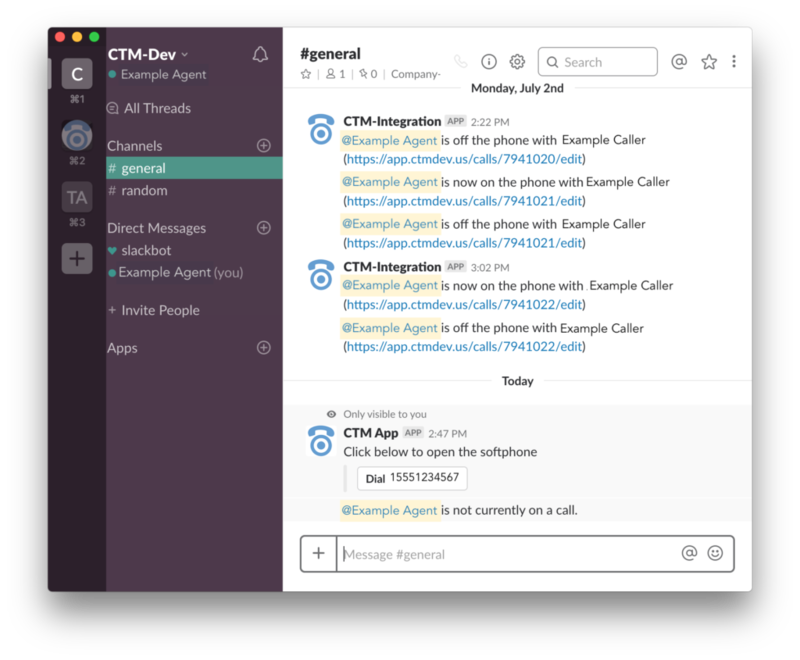 The CTM integration with Slack allows you to check if another agent on your team is available or currently on a phone call, and also provides a shortcut for opening the CTM softphone from your Slack window. /available checks to see if an agent is currently on a call. Add the name of the user you want to check on to the command, like this: /available Fred, and the integration will tell you if Fred is currently on a call. /dial gives you a shortcut the CTM softphone. Add the phone number (including country code) you want to dial after the command, like this: /dial 15551234567. This will open your softphone ready to make a call to +1 (555) 123-4567. The integration will also show you when agents start and stop calls. This log will be posted to a Slack channel of your choice (selected during the setup process). You may wish to designate a Slack channel specifically to show this activity so it does not clutter your main channels. Navigate to Settings → Integrations → Slack. You will be redirected to an authorization page to give CTM permission to link to your Slack account. Click Authorize to allow the connection. On the Slack settings page in CTM, choose the Slack channel that CTM messages will post to. When agents start or stop calls, those updates will be posted here. A list of the users from your Slack account will appear in Agent mapping. Select the corresponding CTM Agent for each user you would like to be linked from CTM to Slack.